By Jim IrvineWhat changes will SB184 make to Ohio law? How do they apply to the average hunter, target shooter, and concealed carry license holder?The Act does not go into effect for three months after it is signed into law (the Governor's office has the signing scheduled for Tuesday, June 10th), but we have received many requests for a list of what this bill does. To that end, here is a summary of the changes in SB184. For all law-abiding citizens (Not just gun owners)PROBLEM SOLVED: Previously, it was up to YOU, AT YOUR EXPENSE AND UNDER THREAT OF IMPRISONMENT, (and sometimes while actually imprisoned) to prove you were acting in self-defense. Now, when the Act becomes law, and as long as there are not any extenuating circumstances, the case ENDS and the healing begins. No hauling off to jail. No worries about criminal trial and the whims of a jury. No civil suit from the bad guy’s family.PROBLEM SOLVED: Previously in a motor vehicle, the actor, not the prosecutor, at the actor’s own jeopardy and expense, had the burden of proof to establish that they COULD NOT run away. Castle Doctrine: If someone breaks into your occupied home or temporary habitation, or your occupied car, you have an initial presumption that you may act in self defense. The prosecutors may overcome this presumption if illegal activity was happening or other extenuating circumstances, such as a husband and wife domestic violence situation. Civil Immunity: Crime victims will be immune from civil actions from their attackers and their families for actions that cause a criminal to be harmed or killed. Duty to Retreat: A person who is lawfully in their residence or vehicle has no "duty to retreat" before using force in self-defense or defense of another. Definition of a "loaded" gun. Section 2923.16 will be the only section controlling firearms transported in cars. Restrictions in other sections will apply outside of vehicles. 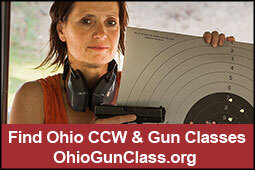 Carrying concealed weapons in one's own home will not require a concealed handgun license (CHL). If a gun is seized and later ordered to be returned to the owner, and the police refuse to return the property and legal action is successful in getting property returned, it is mandatory that legal fees be reimbursed. A CHL holder will be permitted to carry in a government owned building that is not a government facility where business is generally conducted. A CHL will be able to possess firearms in government owned parking garages, rest areas, and shelters. Carry in a BMV is prohibited. The criminal penalty for a CHL carrying in a "no guns" parking lot is eliminated. The property owner retains a cause for an action for civil trespass. A CHL holder will be permitted to pick-up/ drop-off a child in a the designated area of a school safety zone. A CHL holder will be permitted to carry in retail facilities that sell alcohol for consumption off premises. (Giant Eagle, Wal-Mart, carry-out) as long as the license holder is not consuming alcohol and is not under the influence of alcohol or drugs. The holder of a liquor permit for consumption on premises who has a CHL will be permitted to carry in his/her own establishment, and will be permitted to hire police to provide security, including inside the liquor establishment. Sealed and expunged records will no longer be disqualifying offenses and will not preclude persons from obtaining an Ohio CHL. If a person fails to notify a police officer that they are armed during an official stop, and the license holder can prove that the officer had information that he was a CHL, the penalty will be reduced. NOTE: It is still required to notify police that you are armed and this change does NOT change or reduce your obligation to inform law enforcement when you are armed. A CHL holder will be permitted to have a loaded handgun in an unlocked glove compartment and a center console in an automobile. A landlord may not evict a tenant for owning a lawful firearm or possessing a concealed carry license. The requirement for a written test during the re-qualification process is eliminated. A practical test is still required. We will do a more detailed analysis on parts of the bill and illustrate how Buckeye Firearms Association with your support worked to educate the legislature about problems and provide workable solutions that have been enacted. As important as this bill is, we want you to understand the process too. Our laws are still not perfect, and the better Ohio gun owners understand the process, the quicker we can address problems in the future.Thanks for being a part of our team.